The government’s ‘five a day’ campaign was launched nearly a decade ago but a recent survey shows only a small minority of us are getting the recommended five portions of fruit and vegetables a day. The Department of Health is today urging the British public to eat ‘just one more portion’ of fruit or vegetables every day to increase protection against cancer. The likelihood of a person getting their five a day is thought to depend on a number of factors, including how much they earn and what part of the country they come from. Only 17% of people with low household incomes got their five a day, compared with a significantly higher 27% of those with higher incomes. The highest levels of consumption of fruit and vegetables were reported in the south, where over a quarter claimed to eat their five a day. For those living in the north of England, the amount was much lower at 18%, revealing a significant geographical divide. People today are more aware of the importance of eating healthily than they were a decade ago, however, there still seem to be barriers preventing some of us from incorporating enough fruit and vegetables into our diets. The WCRF is holding an awareness day in light of the recent results. ‘Fruity Friday’ will be held on 18 May as part of Cancer Prevention Week. 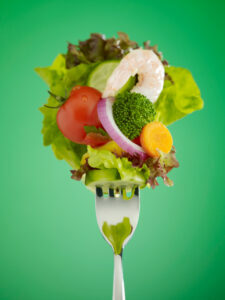 You are advised to eat two portions of fruit and at least three portions of vegetables every day. To find out what ‘portion’ means and how you can incorporate your five a day easily into your daily regime, please visit our Balanced Diet page. Consulting a nutritionist is a fantastic way of educating yourself and your family on the benefits of healthy eating. If you have specific health problems or dietary requirements, your nutritionist will try to tailor your food plan to accommodate for and help treat these problems. Lighting, TV and colour to blame for overeating Coffee – the elixir of life?